'Daringly Different' OGB+ (Sharon McAllister, R. 1992). Seedling 86-11-4. AB, 18" (46 cm). Early to midseason bloom. Standards pale lilac ground, edged tan, fine violet veining; tan style arms; Falls white lilac ground, washed tan around edge; heavy violet veins radiating from large, velvety, royal purple signal; yellow beard, tipped lilac. 'Ballalaika Music' X 'Sunrise in Glory'. 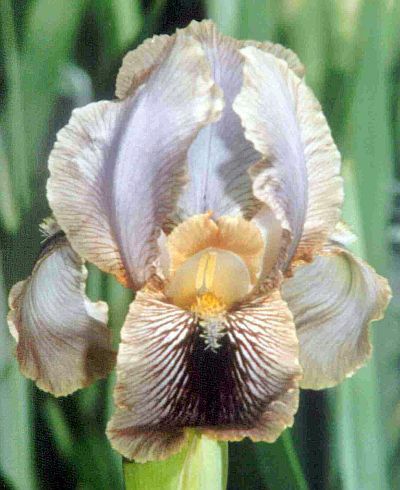 McAllister's Iris Gardens, 1993.